A cast iron radiator will give out far more heat than a modern steel equivalent. It was for this reason and the fact that steel radiators look a bit out of place in period homes, that Paladin resurrected the cast iron radiator, more than 15 years ago. Why Are Cast Iron Radiators more energy efficient? Cast iron radiators are an energy efficient radiator. Studies have shown that the conductivity of cast iron is higher than that of steel and therefore the heat transfer from the cast iron radiator into the room is much more efficient than steel. Steel tends to emit a blast of heat in a short space of time whereas cast iron, although will take a little longer to reach temperature, will gently radiate an ambient heat over a much longer period, even after your boiler is switched off. Will The Boiler Provide Better Energy Efficient Heating With Cast Iron Radiators? Your boiler will benefit from having a cast iron radiator because the temperature of the water that is returning to the boiler is hotter, as opposed to modern steel radiators. This is because a cast iron radiator will hold its heat for longer, providing better energy efficient heating. Will Cast Iron Radiators Be More Efficient In a Modern Building? Originally cast iron radiators were seen as more efficient for period homes, with their vast room spaces and lofty ceilings. Now, however, there is a growing number of heating consultants and architects who are specifying cast iron radiators for new and modern properties due to their energy efficiency and beautiful design choices. 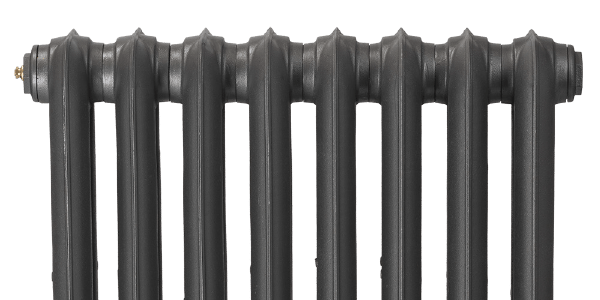 As we move towards more energy efficient heating with the use of our energy resources, modern homes are now enjoying the benefits of the efficient cast iron radiator on modern central heating systems. Our electric cast iron radiators also provide energy efficient heating. They offer a very flexible heating method by allowing rooms that do not require heating during the day to be switched off. This saves money and energy because each heating element has thermostatic control settings. Using the bathroom in the summer, you can heat your electric radiators for extra comfort without heating the rest of the house. Similarly, the heating can be switched off in bedrooms during the day as well as living areas during the night. Our electric cast iron radiators give you the opportunity to enjoy flexible energy efficient radiators and cost-effective heat. Will Cast Iron Radiators Work Well With Green Heat Systems? The popularity of using sustainable renewable energy for heating systems is on the rise. Cast iron radiators are very efficient for green heat systems owing to their excellent conductivity and density. Cast iron radiators work well with today's energy efficient and renewable energy heating systems as they utilise the natural heat generated from the ground or air to heat your home very well. Cast iron radiators hold their heat for much longer than steel radiators. Steel will give a quick blast of heat and lose its temperature very quickly, making the heat pump work harder to keep the property at temperature. As cast iron radiators hold the heat for longer, when the water completes another circuit of heat transfer from the natural source and into the property, the returning water is warmer and the heat pump can run more efficiently.